One of the most delicious meals to eat in the summertime features locally-caught New England Cod. That’s because Cod is a light, flaky fish that can be easily paired with summer fresh vegetables and white wine. At Snug Harbor Fish, we offer a delicious Fried Fish sandwich that customers can request be made with Cod. But for those customers who want to enjoy a lighter dish at home, we suggest picking up a piece of fresh Cod at Snug Harbor and cook it using our Pan-Seared Cod recipe—it will make your mouth water! For a white wine that goes well with this dish, we suggest a Pinot Grigio or Sauvignon Blanc. You can easily pick up a great bottle next door at Snug Harbor Wine. Heat oil in a large non-stick saute pan over medium heat. Add the cherry tomatoes and cook, stirring occasionally, until they’re soft and blistering, but still hold their shape, about 12 minutes. Stir in the basil, lemon juice, lemon zest, salt, and pepper and cook for 2 minutes. Transfer the sauce into a bowl and set aside until needed. Season both sides of cod with salt and pepper. Place cod in the oil and cook until golden brown, about 5 minutes. Carefully flip the cod over and place the pan in the oven to continue cooking for another 5 minutes, or until it’s cooked through. 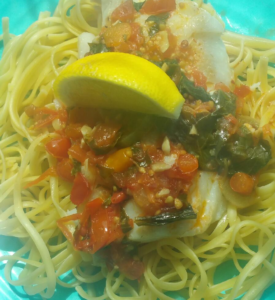 Pour the white wine tomato basil sauce over the cod and serve immediately. Make the dish even more delicious by serving over fresh linguine cooked in olive oil and lemon!